As its name indicates the spark Ignition (SI) engine, uses spark to ignite the fuel. And in Compression Ignition (CI) engine, the air is compressed within the cylinder and the heat of this compression air is used to ignite the fuel. 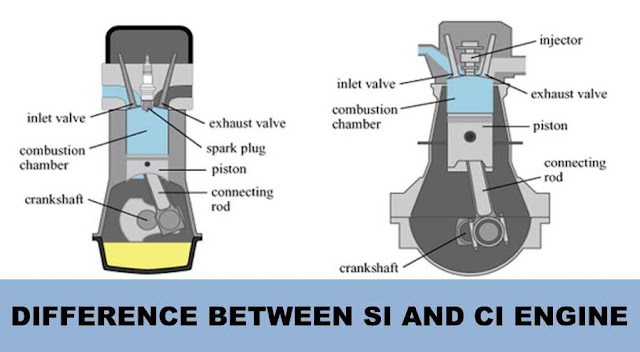 Since spark and compressed air is used to ignite the fuel in these engines, so they are called as spark ignition (SI) engine and compression ignition (CI) engine. 12 to 24 ; Average value 15 to 18 ; Upper limit of compression ratio is limited by thermal and mechanical stresses. Low Speed: 400 rpm.Medium Speed:400 to 1200 rpm.High speed: 1200 to 3500 rpm. Major Overhaul required but less frequently. Limited by detonation. Used only in Air Craft Engines. Limited by blower power and mechanical and thermal stresses.widely used. Less Suitable, fuel loss in scavenging.But small two stroke engines are used in mopeds, scooters and motorcycle due to their simplicity and low cost. No fuels loss in scavenging. More suitable. Mopeds,Scooters,Motorcycle,Simple Engine passenger cars,Air Crafts etc..